Jennifer Jones, Kaitlyn Laews, Jill Officer and Dawn McEwen (from left) celebrate winning the Manitoba title, beating Kerri Einarson Sunday. WINKLER, Man. -- The game Jennifer Jones called was tight, precise, an exercise in patience from the first push out of the hack to her final 10th - end slide. CALL it the Jennifer Jones effect, call it a dose of southern Manitoba love, but residents of Winkler and the surrounding area turned out in droves for the 2015 Manitoba Scotties Tournament of Hearts from Day 1. The cumulative attendance Wednesday through Sunday was 5,810. That included three sold-out days at the 1,200-seat arena, while even the opening days of the round robin came close, with 1,062 filling the stands on Wednesday and 1,148 on Thursday. While the variation of venue sizes and locations makes comparison a chancy business, Jennifer Jones said the atmosphere reminded her of the record-breaking crowds in Portage la Prairie in 2012, where she won her fifth provincial title. When that last rock struck its target, Jones became the Manitoba women's curling champion. Again. That makes seven times now for Jones. Seven buffalo jackets. She won the latest Sunday, after chiselling out a 5-2 win over Kerri Einarson in the final of the Manitoba Scotties Tournament of Hearts. The win was expected, but still an emotional cap to a breathtaking run through these provincials -- one in which the Jones foursome from St. Vital never even trailed on the scoreboard, let alone lost a game. 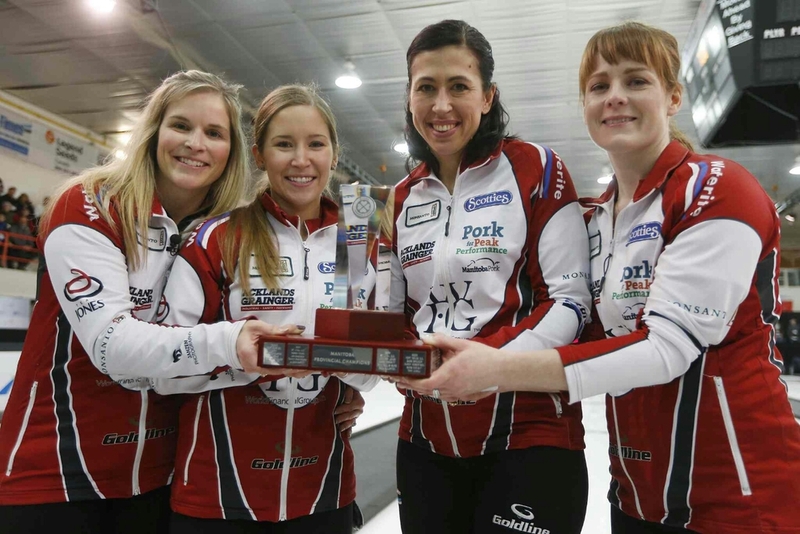 The team will roll out to Moose Jaw, Sask., next month, on the hunt for Jones' fifth Canadian title -- though it would be her first with third Kaitlyn Lawes on board. "It's truly special," Jones said moments after handshakes, with the Winkler arena crowd still roaring its approval. "I never dreamed of winning one Manitoba title, and here we are with seven. We played great from start to finish, and the girls just played outstanding. We had a ton of confidence coming into the playoffs." They also knew not to take Einarson's sparkplug East St. Paul rink lightly. The two teams met Saturday in the 1 vs. 1 Page playoff game, where Einarson, third Selena Kaatz, second Liz Fyfe and lead Kristin MacCuish gave the Jones foursome more trouble than any team they'd played in the round robin. On Sunday, making their second final appearance in the same number of years, Team Einarson held the game close and played gunning to win. "I thought we gave her a pretty good game," Einarson said. "We were doing really well... I wanted to be one of the teams to give 'em a run for their money. We did a great job of that. The girls came out to play tonight, so did I, and we just missed a couple of key shots." For the most part, the game wasn't one of explosive weight or YouTube-gold hits. It was quiet, patient even, as the Jones foursome placed rock after rock with surgical precision. There were pretty come-arounds, perfectly-placed guards. Jones opened with a single; Einarson blanked the next two ends. She picked up a single in the fourth, then kept Jones to just one in the fifth end. The teams went into the break with the Olympic champions leading 2-1. "It wasn't the most entertaining game for fans, so sorry about that," Jones said, with a little laugh. "We did our best. I felt like we made a bunch of shots when they needed to be made, and we never really gave up control of the game." Eventually, something needed to break, and in the eighth it did. Einarson's rock slid too deep, giving Jones a path to the only deuce of the game. That end, Jones agreed, "totally changed the momentum." When Einarson's hammer in nine didn't curl the way she expected, it handed Jones a steal of one. That dried up the last of Einarson's championship hopes, as the Jones foursome -- which also includes lead Dawn McEwen -- proceeded to run her out of rocks. The crowd issued up a thunderous round of applause after Einarson threw her first (and game-final) rock. For Jones' second Jill Officer, the throw that sealed the win was especially emotional: Einarson's lead, MacCuish, is Officer's niece, and the two have long been close. After the match was over, they met their families together at the side of the rink, where aunt and niece shared a long embrace. "That was actually one of the harder games I'd ever had to play," Officer said, wiping away tears. "It was hard yesterday, when we played them in the 1-1 game, but I knew they had another chance. Today was different... but I'm really proud of her, I'm proud of her team. And I know they'll be back." Einarson advanced to the final after a mucky 5-3 win over Assiniboine Memorial's Barb Spencer in the midday semifinal. It was not, strictly speaking, a particularly beauteous game of curling, as both teams wrestled with a slew of misses. In the end, Spencer's simply came at worse moments. The teams were tied 3-3 when Spencer's ninth-end draw curled too far and wrecked on a guard, handing Einarson a steal of two. Then in the 10th, an Einarson miss gave Spencer a chance to pick up a deuce and force an extra end; but the skip's first throw came in too light, and settled outside the house. All Einarson had to do then was peel off the last Spencer rock in the rings to run her opponent out. Jennifer Jones has won the Manitoba Scotties Tournament of Hearts six times (Anil Mungal). Olympic champion Jennifer Jones looks to maintain her golden touch as she aims for a record seventh provincial title as skip at the Scotties Tournament of Hearts presented by Monsanto, starting Wednesday in Winkler, Man. Jones could have tried to accomplish the feat earlier except she’s missed the event four times due to holding an automatic berth to the national Scotties as Team Canada. Her Winnipeg-based rink also skipped last year’s tournament while preparing for the Olympic Winter Games. With no defending Manitoba champion — last year’s winner Chelsea Carey moved to Alberta and dismantled her team — the Sochi gold medallists received the top seed for this year’s tournament. Team Jones continue to top the World Curling Tour’s order of merit rankings and have won the Curlers Corner Autumn Gold Curling Classic, Canad Inns Women’s Classic and Karuizawa International titles this season. While Jones is the odds-on favourite to win this event, she’ll also be the skip everyone will be targeting to beat. Jill Thurston, the 2010 Manitoba champ, earned the No. 2 seed and leads the list of teams looking to knock off Jones. Thurston hasn’t had much success against Jones lately with Jones winning all three meetings this season including the C-qualifier final at the Canadian Open in December that eliminated Thurston from the Grand Slam event. McDonald, who won the Manitoba title last season on Carey’s team, returned to the skip role this season and reunited with lead Raunora Westcott and second Leslie Wilson-Westcott. Kate Cameron, who skipped her own team the past two seasons, came onboard at third. Although playing a lighter schedule this year, McDonald competed in both the Masters and Canadian Open Grand Slam tournaments. She enters this event after winning the Granite Ladies Cash Spiel earlier this month (including a win over Thurston in the semifinals en route to the title). Thurston and McDonald are neck-and-neck on the WCT order of merit rankings with McDonald holding the advantage sitting one spot ahead in 13th place. Two-time Manitoba champ Barb Spencer is seeded fourth followed by Michelle Montford. While Montford doesn’t have the experience as the other four skips ahead of her in the rankings, she has been making noise on the World Curling Tour this year winning the Sunova Spiel at East St. Paul and the MCT Championships tournaments. Kerri Einarson is another hopeful contender after looking to be the favourite last year finishing the round robin with a 7-0 record before falling to Carey in the final. In a battle of two curling powerhouses, two-time national champion Rachel Homan and her world No. 3-ranked team of Emma Miskew, Joanne Courtney, and Lisa Weagle came out on top, defeating Team Jones to win The Pinty's All-Star Curling Skins Game women's final. Overall, Team Homan pocketed a total of $52,000 from this weekend's Pinty's All-Star Curling Skins Game, held at The Fenlands Banff Recreation Centre in beautiful Banff National Park. "It's definitely the most money I've ever played for, for one curling shot," said Homan. "Jones gave us a run for our money… literally. It was a good game and we're pretty excited to take home this cheque from Pinty's." After this afternoon's game, Manitoba's Jennifer Jones and her world No. 1-ranked team of Kaitlyn Lawes, Jill Officer, and Dawn McEwen walked away with a weekend total of $29,500 in prize money. Team Homan started off strong, making an angle raise takeout with the hammer to win the game's opening skin of $2,000. Skip Rachel Homan made another brilliant angle raise takeout – with third Emma Miskew making a terrific line call – to steal the second skin and double their total. After a slow start, a solid third end performance from Team Jones put them on the board with a $3,000 skin. With each team winning one skin over the next two ends, the game was tied at $7,000 going into the 6th end. Homan made another brilliant last rock shot to win the $6,000 skin and force Team Jones into a do-or-die position. The all-important seventh end saw Team Jones narrowly force a carry-over to stay alive. It all came down to the final end, with Rachel Homan making a soft touch tap back to score two and capture the championship.